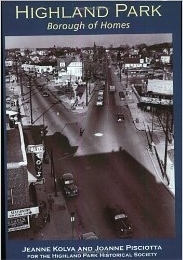 The first book of historic images of Highland Park, New Jersey. Published in 1999, this pictorial written by Jeanne Kolva and Joanne Pisciotta is packed with old photos, drawings, ads, and maps. 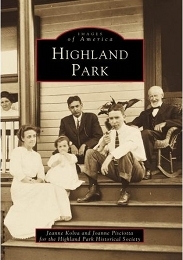 The definitive history of Highland Park, New Jersey. Over 150 pages of local history from the time of the Lenape to today. Contains an authoritative text detailing the town's growth from isolated colonial farmsteads to trolley town and mature suburb. The book is illustrated with over forty historic photographs, ads, and maps, including a tavern license petition from 1788! We would like to thank Evan Brownstein of B.Beamesderfer Gallery for selling copies of the Highland Park book at his shop on North Second Avenue for the last five years! Evan is truly one of the beautiful people!